Enjoy a two days get away at the Khao Kheow open zoo. This ‘2 Days 1Night + Flight of the gibbon’ excursion offers you a great escape away from your routine life. Leave all your responsibilities and tensions behind and just enjoy your freedom for once. Start your day with warm welcome at the Khao Kheow open zoo and spend a lazy late morning wandering and admiring the scenic nature. The afternoon gets better as you lunch in the Green Hills restaurant. On day 1, the zoo takes you through one of the most memorable times you could have. The sightseeing and animal feeding safari is enjoyed by both adults and children alike. Spend a lighthearted afternoon in the company of beautiful Deer, Rhino, Giraffe, Tapir, Hippo, Flamingo, Penguin, Chimpanzee, Orangutan, etc. It’s not over yet; there is still the unique parade of painted storks and elephant ride that takes you wandering through the serene wildlife. In the evening, after yet another appetizing meal at the Green hills restaurant, the zoo seems to take a new avatar. Thailand’s best night time Jungle Safari begins at dusk. The After Dark Safari inclusive of Cat Complex, Journey to the Jungle After Dark Safari and tram ride is a thrilling experience for most tourists while they get up close with the nocturnal side of the jungle. You can definitely call it a day after the adventurous stroll in the dark. It won’t be a surprise if you sleep like a baby. An adventurous day might have exhausted you into sleeping but the excitement of the next day might keep you up. If you do feel sleepless, the calmness of a starry night in the jungle will prove to be an added treat. 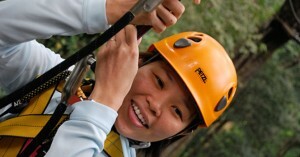 Khao Kheow Open Zoo has a range of accommodations from comfy tents, willow, fir, to crown villas. These are self sufficient with modern facilities and furniture and yet coherent with nature. The day 2 starts with the Sunrise. Allow the morning sun to kiss you and feel blessed. Have you ever had an orangutan as your breakfast companion? If not, today you will. At 7 am it is time for ‘Breakfast with Suriya’, our friendly and funny orangutan. 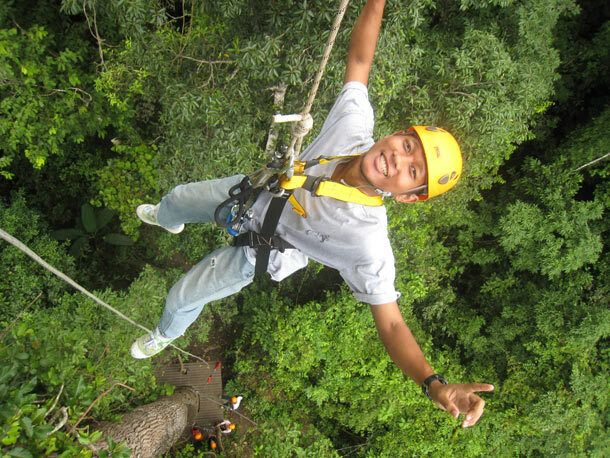 Thailand boasts of the longest zip line adventure in the world and its right here in the Khao Kheow Open Zoo. Post breakfast; get ready for some hard kicking adrenaline action in ‘Flight of the Gibbon’. 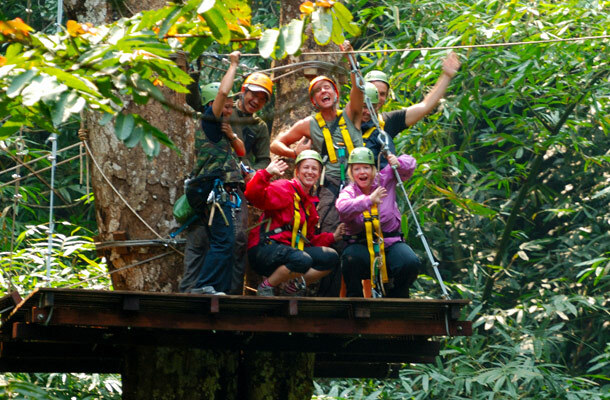 This unique animal safari will have you explore the jungle and its airborne creatures in an airborne style with the help of 3km long zip-lines, sky bridges, exhilarating abseils, jungle trekking and our expert rangers. With all the wonderful memories and experience is time to end this escapade with rich Thai lunch.